Call Center Inbound - Contact Center Euro Connect | The Best Outsourcer! It is a structure made up of human resources, hardware such as PCs, headphones and servers and integrated services, capable of receiving numerous customer calls to provide an excellent Inbound Customer Service. A Geographic phone number (with local prefix), a Toll Free Number or a Paid Number (such as 199) is usually provided, which is then configured on a VoIP switchboard that allows for the so-called "call queue" to be managed with configurable messages during the classic waiting period before that an operator could answer (take the call). 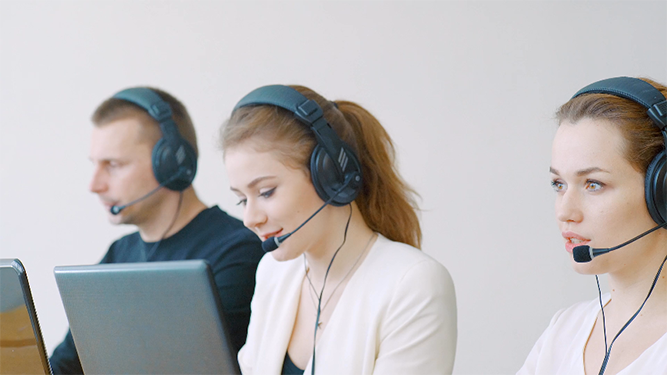 As Inbound Call Center’s Operators respond to the customer calling, Euro Connect’s software allows the call to be tracked, its quality to be monitored, and a service ticket to be associated to resolve the issue. Euro Connect’s Inbound Contact Center, what makes us different? We are not just an Inbound Call Center, but an excellent structure that integrates all services needed by customers to interact with your business. This is the key point when the customer calls or writes to your company’s inbound customer service – he expects to resolve his issue and be heard and assisted accordingly, not to bounce on a rubber wall. The Inbound Customer Care is the first and often the only direct contact line between a potential or already existing customer and the company. The opinion (Customer experience) that customers will have for your brand is in fact dictated by only three factors: Marketing - Product Quality - Customer Service. If we literally translate "Customer Care" we find out that it means: "To take care of the customer". This is the key concept on which Euro Connect's Outsourcing Customer Services are based. We take care of your customers as they are ours. This way your company will be free to focus on its real core business. Euro Connect's inbound call center software is developed to allow your customers to provide a feedback about each contact made by phone, chat, or mail. Only then you can truly monitor the satisfaction level generated by our Inbound Customer Care with all the data you need to improve your processes and services. Euro Connect’s inbound Call Center is first of all focused on quality (to date we have never lost a customer). All operators that are part of our Customer Care Team are all native speakers or at similar level, speaking Italian, English, French, Spanish, German, Russian, Portuguese, Dutch and their primary goal is the satisfaction of customers that are calling us. 80% of the calls are answered in the first 30 seconds and customers never wait for more than a minute in queues thanks to the “Call Me Back” system; we currently receive more than 152,000 calls per month. Call-to-phone customer requests are increasingly declining in favor of faster channels such as Mail, Chat and Social Network, therefore our Call Center has become multi-channel and multiplatform. The email service is via an e-mail address provided by the customer or by ourselves, which is interfaced with a Trouble Ticketing Software to be able to monitor the managed and unmanaged emails. This way, no email is lost and, depending on your needs, we can guarantee the management within minutes of receiving. It’s very useful to increase your sales, because often the customer needs only a little boost to complete the purchase on your site as he may have a doubt or simply is not practical about how to process the order. Chat is fast, instant, and also works on Smart Phone. The latest Business Unit born within Euro Connect’s Inbound Call Center is related to the Social Customer Service. With Social Networks the revolution took place, while few years ago, who contacted Customer Service had no one to complain about the poor service, today he can do this in public on all social platforms, from Facebook to Twitter via Google+. With Euro Connect’s Inbound Call Center you will be sure to keep your Brand Reputation high, even on Social Networks. Our Staff, your operators, are the focal point which rounds out the quality of your customer service and the satisfaction of the latter. In Euro Connect we focus on our employees’ training, taking care of every single aspect. We do not stop by providing them a script and product floss as often happens, but we also focus on small details such as voice tone, kindness, empathy, preparation and their personal satisfaction. A satisfied staff will make your customers happy.